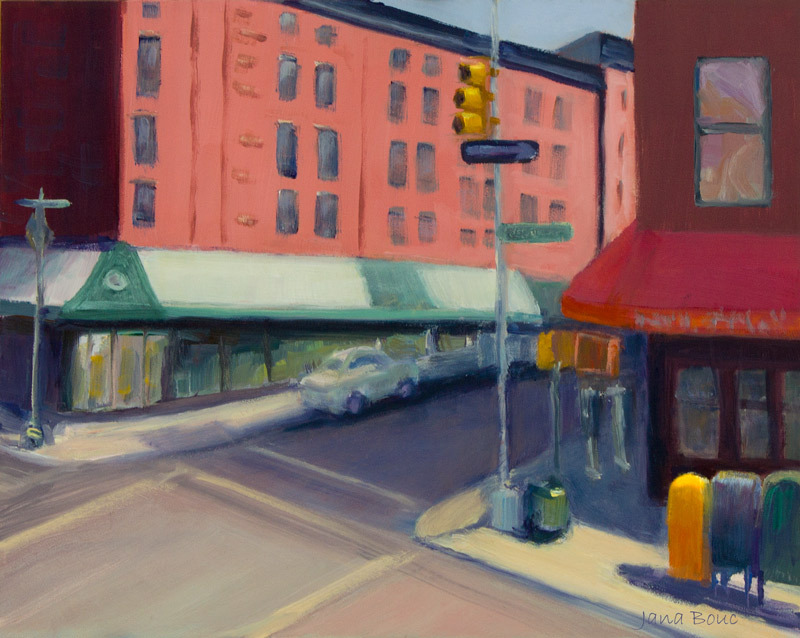 Bleecker and Sullivan Streets, New York; Oil on Panel, 8"x10"
When I saw that this month’s Virtual Paintout was taking place in Manhattan, I wanted to paint the Lower East Side tenement where I lived when I made my big move to New York City from San Diego, California at the age of naive and tender age of 19, chasing my dreams. I couldn’t find the building where I lived on East 13th Street between Avenue A and B (possibly torn down and replaced by a small community garden) using Google Street View but I could see that now it’s fluffy with foliage and yuppified with yoga studios. 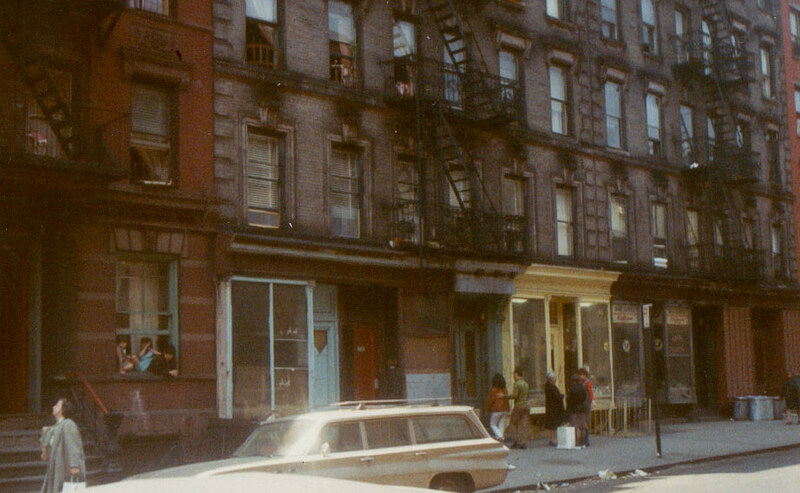 There were no gardens or trees on East 13th Street when I lived there, just trash cans, junked cars and the occasional group of men playing dominoes on card tables in front of their storefront church downstairs or throwing dice on the corner by the drug store. 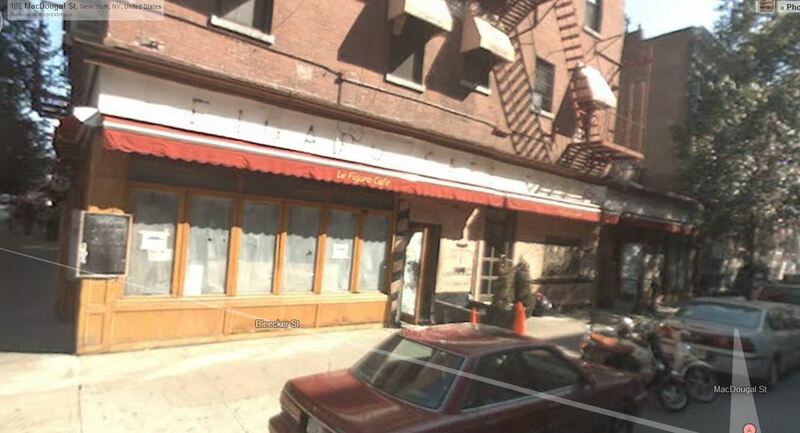 Next I looked for my favorite Greenwich Village cafe back then: the historic Le Figaro Cafe (New York Times article) which survived 50 years before closing down in 2008. It had famously been the haunts of Bob Dylan, Lenny Bruce, Dave Van Ronk, and Jack Kerouac. Lovely paintings and so much fun to see The Village, Jana. What years were you there? I was there in 1952-1956. Hi Annie, How fun to know we shared a similar piece of personal and geographical history, even if we were doing it at different times. I was there in 1969 but you were there in the era I wanted to be there — the Beatniks. San Diego was so behind the times that I thought I would go to Greenwich Village and find it full of Beatniks. But no, it was full of wannabe hippies from New Jersey and the Beats were long gone. It’s fascinating the way the Lower East Side has been the landing place for poor immigrants, with the nationality changing every so many years. When I arrived the area was filled with mostly Puerto Rican immigrants, but there were still some old Italians and Eastern European Jews remaining. There was an old Italian woman in my building who’d lived in her apartment for 50 years. Mine was rent controlled and the previous tenant had lived there 30 years so my rent was only $54 a month (except the landlord did some “renovations” and raised it to $60). Lovely hopeful colors! Very nice! That painting turned out well. It looks like “small town USA” to me even though I know it is in New York. It has an old timey feel to it. It looks Hopper-esque to me! I really like this – very Hopper-esque. Funny, I was just in NYC and actually wondered if it would ever be chosen for virtual paintout. Hi Jana, when I was going thru the entries and came to yours, the question that went thru my head was, where did she find a spot where there are no people or vehicles? Knowing very little about “life” in NYC, I thought, hmmmmmm. there is a quiet time in the city. I like your clean crisp lines, your good drawing (so important to the end result) and the shapes you included like the traffic light, the mailboxes, the car. You shaped them beautifully with their individual colors. Really a lovely painting. And, also really enjoyed the back story of yours and others who lived in NYC. Thanks for coming by A Camp Host House’s Meanderings and leaving your comment Jana. I appreciate it! Love your painting and your story of going to NYC at the tender age of 19. Love it. I went to L.A. from little old NC when I was 22 following my dreams. It was one of the best things I ever did in my life. Oh, the age of nineteen – and the pleasures and pains of going back to a place with contradictory memories. I was an art student in Melbourne and traipsed around the inner suburbs – our Tech. School was in Prahran. Going back there (for other purposes than nostalgia) I couldn’t find many of the landmarks, but the emotions were there, and I was filled with the stories of that time. I love the colors and the history behind those building and street you described so well. Congratulations!